Good Morning and Happy Halloween! The Les Enfants team have worked their socks off this weekend creating spooky parties that I hope haven’t caused too many nightmares. Did you have a halloween party this weekend or are you saving it for tonight? Be sure to share your pictures with us here over on our Facebook page. I am sooooooo excited about todays real party! Karen of Creative Cotton Bags, contacted me a couple of weeks ago to let me know about the party she was planning for her daughters 16th birthday and I immediately said yes to featuring the party here, just from the preview photos. I loved the fact that this party was for a teenager as so many parties featured on blogs are for little children, but even big kids love a themed party! 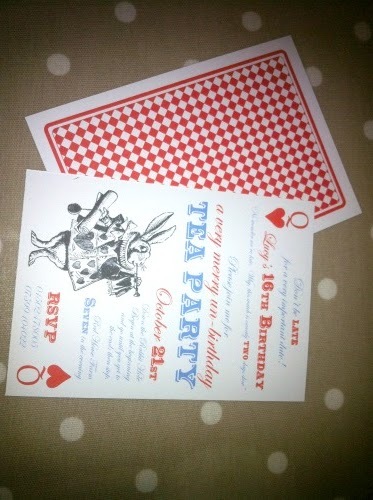 So I shall now hand over to Karen to share how she created her very own Mad Hatter’s Teaparty. Party. I felt it had a lot of scope for twenty 15 and 16 year old girls! 20 and then to just be left to dance! girl, opted for the Mad Hatter. tressle tables. It soon all started to come together. white cake and I then decorated it with an abundance of penny sweets. had a go and was delighted with the results. lovely we had a sit down family meal for 16 in there the following night. Wow! It looks like your daughter and her friends had a wondeful time. I reguarly say on this blog ‘with a bit of imagination you can create an amazing party’ and I think you will all agree that Karen is most definately proof of this. Thank you Karen for sharing this party with us. Do you have a party you would like to share on this blog? Please get in touch, we really do love seeing all your amazing parties here at Les Enfants.